After a longer-than-should-have-been delay (you can blame me for that) allow me to introduce JetPack. I’m really excited about this theme and the work that our team put together here. You may have see Tsitsi talk about theming in general and introduce this theme on Silverlight TV. 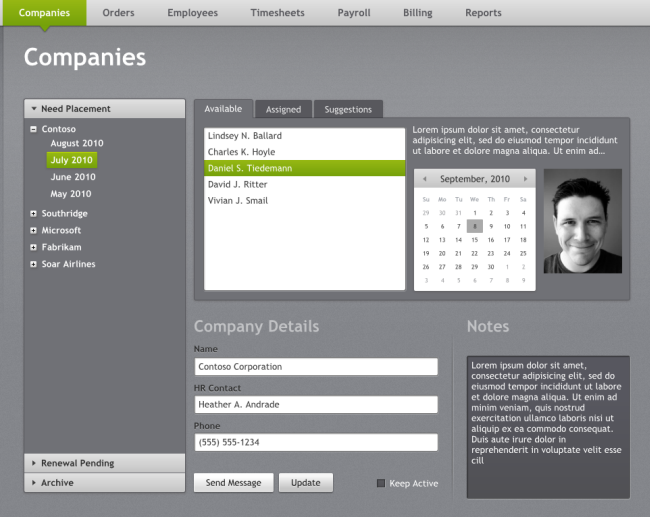 The challenge behind this theme was to take some of the excitement around other Silverlight themes and create a great looking overall theme that could be used for line-of-business applications, but also extended as desired by any other application. Working with the team at Pixel Lab, our small team looked at areas of inspiration from various online and client applications that are popular and what worked well about the user interaction on those themes. Robby and team did a great job in my opinion of creating a very well designed theme that can be used in almost any circumstance. During this September refresh of the themes we’ve also updated the previous 3 themes: Cosmopolitan, Windows and Accent Color with some minor fixes and tweaks based on some feedback we got. You can see a preview of the various styles in JetPack here. We hope you enjoy JetPack as much as we do! We’ve provided the theme pack in the same way as we have the others, as templates for Visual Studio 2010 and Expression Blend 4 and the raw assets (resource dictionaries) for you to download. Each Visual Studio template is build for modeling the Silverlight Navigation Application template and the WCF Ria Services Business Application template. We’ve provided the VSIX installer formats so you just need to download that, double-click and you’ll have them in your File…New Project window for selection. Thanks for your patience through the release of JetPack, there were some moving parts in the end (mostly delays in our release management system which underwent some changes) that were human-caused [blame me] but we’re glad to finally get it out in the wild! Download all the themes here.